Being in the construction business comes with a diverse range of business needs, but most of the challenges boil down to balancing doing what's best for your customers with what's best for your budget. At Couser Supply, Inc., we help construction workers, remodelers, decorators, and other customers protect the properties they work on without overspending on supplies. As a trusted source of temporary floor protection products around the country, we focus on giving our customers products they can count on. That's why we offer supplies that not only protect floors from dirt and dust, but also wear, tear, scuffs, and more serious damage. While our temporary carpet protection options are very popular, they shouldn't be used on wood, vinyl, or other hard-surfaced floors. However, we do have other products that are perfect for these surfaces. Talk to our professionals to discover which items suit your needs best. Why waste time and money installing pricey protective products when you can get the same level of protection and save on your bottom line? With our coverings, you can get the true value you deserve. Our products are made from immensely tough and incredibly durable polyethylene film that resists punctures and tears. 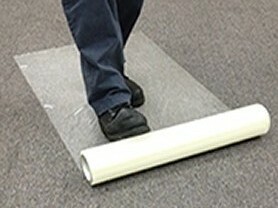 The temporary floor protection options come with a special low-tack adhesive underside so they don't slip and can be overlapped without the use of tape. Furthermore, you can choose mats that have adhesive on the top as well that grab dirt, dust, and grime from work boots, allowing you to further ensure your clients' complete satisfaction. Are you doing everything you can to make sure your clients' homes and businesses are spotless after a construction or renovation job? Unfortunately, even if you do outstanding work, if you don't clean up well after the job is done, the customer won't be happy. But cleaning doesn't have to take as much time, effort, or money as you may think. With our temporary floor protection solutions, you can simply stick the polyethylene sheets on the ground before you begin working and peel them up when you are done. What may have taken an hour or more of labor now becomes a minute or two. If you need help choosing one or more of our products, simply browse our site or talk to one of our professionals. We have many locations throughout the United States, so no matter where you are building, we can help make it easier. Contact us today to learn more about our temporary floor protection products. We are proud to offer floor protection solutions to customers across the country.